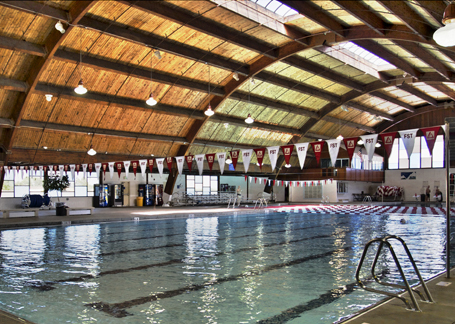 Carmody Recreation Center is a full service facility providing aquatic, health and fitness, and sports activities for youth, adults, and seniors. The center offers both indoor and outdoor swimming pools. The indoor pool is a T-shaped long course 50-meter pool with seven lanes. The T-shaped portion consists of six 25-yard lanes that run across the pool used for short course training and competitions. In July 2007, Counsilman-Hunsaker conducted an aquatic assessment of the 4,500 sq. ft. outdoor 25-yard training pool as well as the 9,379 sq. ft. indoor 50-meter swimming pool, which was losing 3,000 gallons of water per day. The assessment identified items that were substandard, obsolete, not meeting current state code, and/or not operating as designed. In addition to the evaluation, an opinion of probable cost for recommended repairs was provided. In 2008, the City of Lakewood once again retained Counsilman-Hunsaker to bring the swimming pools up to industry standards by replacing the existing gutter system with a stainless steel and gutter; replacing the entire mechanical, system; and replacing the PVC liner with a Diamond Brite finish. Construction is slated for summer and fall of 2008. These repairs will improve water turnover in the pool, help maintain chemical levels and consistent water temperature, and improve water clarity and circulation.